Music folders are available in 2 sizes. 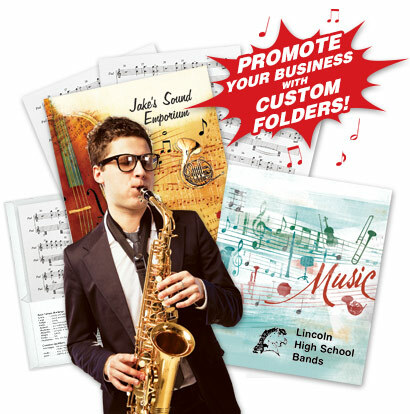 Custom Band Folders organize and protect music for students while providing promotional solutions for retailers. Offer practical and long-lasting promotional items, making your ad dollars work harder. Provide affordable custom give-aways that music departments and students will use daily. Show school support when provided to local bands and orchestras, creating positive PR for your business. Create repeat name exposure and recognition, sending more music customers through your door. Promote school spirit and pride. Provide a professional and unified look for concerts and other performances. Download our Music Folder Catalog (PDF) and Order Form (PDF). Music folders are available in 2 sizes: Standard Music Folders and Large Band Folders. Request our brochure and a FREE sample. We offer many options to suit your promotional needs. Submit logos and press-ready files quickly and easily.